Conrad “Yukon” Exner, age 91, of Friendship, formerly of Racine Wisconsin, passed away suddenly Friday, November 23, 2018, at Meriter Hospital in Madison, Wisconsin. Conrad was born January 12, 1927, in Racine, to Conrad and Helen (Schmidt) Exner. He enlisted in the United States Navy, at the age of 17, serving during WWII and was later honorably discharged. Yukon married Margaret “Marge” Szepesi on June 25, 1948, in Racine. They were married for 64 years when Marge died in 2012. Yukon worked for Western Electric for 35 years prior to retiring in 1986. Yukon and Margaret then moved to Friendship where they resided until their deaths. In the beginning of his life in Friendship, Yukon wrote a column for the Adams-Friendship paper called “Outdoors with Yukon.” Yukon was also well known for his singing and yodeling. 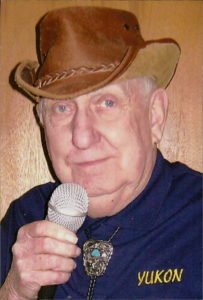 He enjoyed entertaining at Villa Pines and other senior centers. As his “fame” spread he received many requests to play at local taverns and for parties. Yukon was also a talented artist. Many of his cartoons can be seen in local businesses around Adams-Friendship. He was preceded in death by his wife, Margaret; parents, Conrad & Helen; brother, Gerald Exner; granddaughter, Shannon Gallagher, and Grandson, Justin Exner. Yukon is survived by his children, Barbara (Tom) Borgiet, Deborah Krapcha, Gary (Connie) Exner Sr. Scott (Tammy) Exner, and brother Leroy (Millie) Exner. He is further survived by grandchildren & great-grandchildren. Per Yukon’s request, no services will be held. You will be missed ty for being wonderful to my mom ! You always made my mom smile and made the dark, light for her ! I hope you rest in peace you sweet sweet man ! Our deepest sympathy to the family. Yukon was a familiar face to many at the Adams flea market.. He was always there early to make the rounds and find the best deals. We will miss his smiling face and music. R.I.P. Yukon. I have all the drawings you did of “Alfie” framed an on my wall. What a talented man you were and a special friend to “Audrey”. My sympathies to the family. You have been missed in the community but you have left many great memories. Another wonderful volunteer who brought many smiles to many faces by his humor and music. Rest in peace yukon. He will greatly be missed,loved talking to him and seeing his smiling face.prayers to all. Yukon was such a kind man. He was a bright light anytime you saw him. He will definitely be missed. Condolences to the family. Yukon was such a kind, gentle soul who was loved by many. He was a man we truly lived to see and talk to at the bakery. He would sing for us all the time. Truly blessed and a joy. He will br sadly missed.